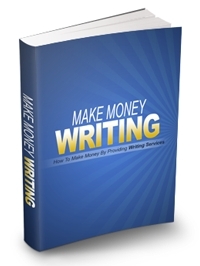 "This Report Will Show You How To Make Money By Providing Writing Services To Other Internet Marketers"
"Learn how to make money by writing - the right way..."
1. Why writing is a great way to earn money. 2. How to compete with cheap writers, even if you charge a lot more money. 3. The "Double Dip" writing strategy that will let you earn a lot more from your writing. 4. Why selling PLR (Private Label Rights) content is such a powerful strategy for writers. 5. Where to find enough writing clients to fill your calendar for months.